Richard Tan, General Manager Of InfoComm Asia 2008, Looks Forward To November’s Hong Kong Tradeshow With Optimism SCN Asia: Tell us a little about the economic backdrop behind this year’s InfoComm Asia show. Richard Tan: The last Integrated Systems Asia show, in Singapore in 2005, addressed the South-East Asian market at a time when that market was only just coming out of its last financial crisis. Today, in Hong Kong, the situation is very different. Here we are able to develop an event that is truly pan-Asian in character, adding Japan, Taiwan, Korea, India, and other territories to the mix. Making business a pleasure: The Hong Kong Convention & Exhibition Centre is not just beautifully located—it’s convenient for out-of-town visitors, too. Geographically, Hong Kong is better placed to suit that purpose. Economically, while there is a lot of volatility on a global basis, if you look at the last 12 months, the markets in Asia have not really suffered to the extent that other markets have suffered. We are still faring pretty well. There is a good reason for that. Historically, Asia was very dependent on the U.S. economy. Today, for the first time in our history, we have an additional two pillars—China and India—on which to build our economic strength. And if you look at South- East Asia, while there is instability in a couple of countries, overall the economy is in better shape than it was three years ago. SCN Asia: You mentioned the location of Hong Kong as being ideal for this event. What about the convention center itself? RT: Quite simply, you couldn’t find a better venue in the whole of Asia. 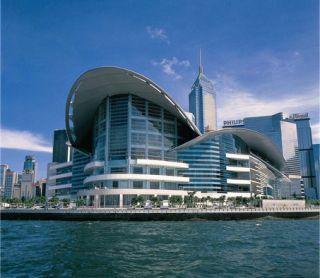 The Hong Kong Convention & Exhibition Centre is superbly located, overlooking the water—it really is beautiful. But aside from aesthetics, there are some very important logistical considerations. Hong Kong has two options for a show of this kind, and we chose this one because it is much more convenient for business visitors. To begin with, there are many, many hotel rooms within walking distance—literally thousands of rooms. Also very important is the fact that the terminal for travel between Hong Kong and China is just a stone’s throw from the venue. So visitors coming in from Shenzhen or Guangzhou are only five minutes away once they’ve disembarked from the bus. Finally, Hong Kong Airport is a highly efficient travel hub for Asia—one of the most centrally located, and very convenient for international travellers. SCN Asia: What kind of show are you expecting to host in November? RT: First and most importantly, Info- Commm Asia 2008 will be the largest InfoComm show ever held in Asia. The last one we held covered 4,300 net square meters of exhibit space. This year we will be close to 6,000, and we are expecting around 250 exhibitors to be showcasing their products. But, as always with InfoComm, there is a lot more to the event than a large tradeshow. During the first two days of the show we are hosting the InfoComm Asia Summit, which will include InfoComm education sessions, manufacturer presentations, and Pan-Asian industry conferences. We also have a one-day Transportation Industry Conference, which we are organizing with the Control, Automation and Instrumentation Division of the Hong Kong Institution of Engineers. They have a network of organizations that they work with around Asia, and we will have representatives from the airport, the Mass Transit Railway, and the seaport. These people are developing a worldclass transportation hub for Asia, and will be discussing their need for cutting-edge technologies to deliver infotainment, as well as the use of RFID technology in transportation. building professionals and architects in particular. Both these conferences are designed to bring groups of specifiers to the show. Because of the somewhat unique nature of the Asian market, many end users are involved in the decision-making process, so it’s important that we bring them to the show, to create an awareness of the technology, and an appreciation of the value that those technologies can bring to a project. We should also mention the technical site visits that we are organizing for the third and final day of the show. We will bring delegates to the command-and-control centre of Hong Kong international airport, to the control rooms of the MTR rail system, and to the IFC (International Financial Centre) building, the tallest office building in Hong Kong with a large shopping complex—a huge development that also has a very sophisticated command-and-control centre, which we will also visit. SCN Asia: The market for AV technology and electronic systems integration in Asia is growing very fast. Which market sectors, in your view, are driving that growth? RT: The most obvious growth markets are transportation and infrastructure development. The extent to which Asia grows in the future will depend on infrastructure, and that is particularly true of China and India. There’s a lot of that development coming on-stream now, and a lot more on the table. China alone plans to build something like 79 airports between now and 2020. The Chinese can have very severe winters which can create a lot of problems, so their land transport infrastructure needs to be improved as well. India is also going to need a lot of investment. At the moment, to ship something from one side of India to another can take longer than shipping it to the U.S.
SCN Asia: Are there any particular technologies that are benefiting very significantly from this growth? RT: Well, you just can’t ignore digital signage. There are so many shopping malls, airports, hotels, and so forth going up in Asia now. We are fortunate in that ours are newly developing economies, which in some ways makes it easier for us to engage with new technologies. This is in contrast with the more developed economies of the west, where the technological infrastructure has been in place for a long time back. The fact that we are just beginning to be able to install new technologies means we are very open to new ideas. Also set for a good level of growth in Asia is telepresence. Air travel is going to cost a lot more in the future, and that’s going to drive the use of videoconferencing technology. We’re going to see not just strong growth but also sustainable growth in that market. In Europe and the U.S., the corporate community is accustomed to having meetings using videoconferencing technology, whereas in Asia we are much more used to face-toface meetings. So it’s going to take a rise in energy costs for that culture to change and that, of course, is what is happening. When you look at the technologies that are typically showcased at an InfoComm show, these developments affect almost the entire range of products. If you look at transportation, hospitality, these applications need everything—from distribution to display, everyone benefits. SCN Asia: What themed pavilions will we see at InfoComm 2008? RT: We will have an area which we are branding ‘et4’, or entertainment technology for establishments, public spaces, theme parks, and integrated resorts. As market competition becomes more intense, restaurants, retail malls, and corporations are going to be compelled to think out of the box to engage their customers. A definite trend towards interactive entertainment experiences has emerged, and we will focus on the ability of technology to create high-impact entertainment on the frontline. We will also have iHS, our intelligent homes area. The smart-home business is just starting to take off in Asia, but it has its own distinct character. In contrast with the U.S., where you are looking at single dwellings, here we’re looking at large-scale apartment developments. Ten years ago architects started to provide a backbone for building automation. Five years ago they wanted to branch out from building automation into the apartments themselves, and have them wired for home automation. And now, in the past few years, developers are saying it’s not enough to have the homes wired—they want to be able to provide the devices as well. So now it’s more common to see MDUs complete with flat panels, security, lighting control...the whole works. If you imagine those kinds of systems replicated across 500 units, you can imagine the scale of such a project, and the kind of growth we will experience. We believe it will be exponential.